The mosaic located 2.10 m below the present church floor belonged to the Church of St. Maria Latina from the 12th century AD. 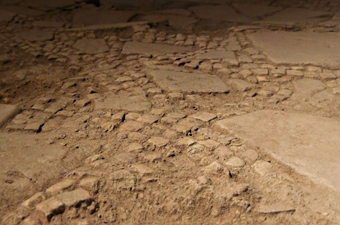 No predecessor of the medieval church of St. Maria Latina could be found beneath the Church of the Redeemer. Of the church itself only part of the floor mosaic remains, which was severely damaged by later building and remodelling measures. The mosaic was based in a layer of mortar that has been used to level the substrate. The mosaic itself is composed of recycled marble pieces and white (and a few grey, black and red) "tesserae" (mosaic stones). That the mosaic belonged to the crusade-period church is suggested by the fact that it is at the same level as the contemporaneous yard area adjacent to the church, now the cloister of the Provost’s Office.